There is a strange meteorological process in Orkney which is seen nowhere else in the world. It occurs when, by a sort of wind-borne osmosis, the very air absorbs moisture to saturation point. That’s what hit us today. It’s not really raining, more just generally and comprehensively sopping wet. It started that way this morning and it has carried on. However, we will now stop discussing the weather or it will turn into a rant of unseemly proportions. Frankly, for the unmentionable reasons above, not much digging was done today. Some brave souls refused to leave and carried on through the drifting mist, notably in Trench T, beyond the house. There is such a thing as trench loyalty involving an ever-so-slightly sniffy attitude to everyone else’s trench. The diggers in Trench T seem to have embraced this and clearly regard the main trench as not quite as good as their own. Their industry is remarkable but, rest assured, when they are rotated to Trench P that attitude will be reversed. The real excitement today came with the further washing of the magnificent stone shown in yesterday’s blog. This has to be done carefully to avoid causing scratches when removing the remaining gritty midden. 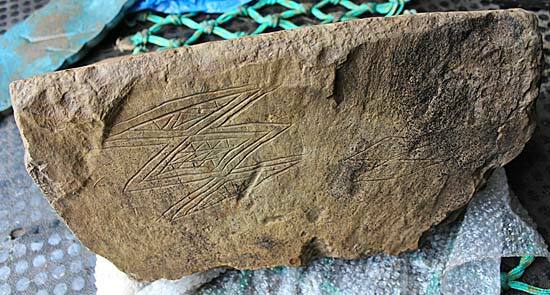 With gentle sponging and copiously poured water the danger was averted and even more finely incised lines have been revealed. In some areas it looks as if the lighter incision is almost trial work for the finished product, but other areas have been left unfinished. Perhaps the process of carrying out the work was as important as bringing it to a conclusion. Site director Nick has been thinking about the significance of the find spot of the stone which, as we mentioned yesterday, looks almost like a foundation or votive stone. He believes that it is likely to have formed part of the original inner wall face of the Phase One use of the building and this earlier attribution may also be borne out by the presence, right alongside the stone, of a finely incised Grooved Ware vessel. As we have mentioned before, it is likely that the incised decorated version of Grooved Ware precedes the applied decoration type. As we have plenty of examples of applied pot from higher up in the structure, the presence of an incised vessel lower down makes sense. There is also a possibility, he believes, that the work on the corner buttress, which has revealed the stone, has also raised the idea that Structure Ten collapsed partially before the interior was converted from rectangular, with rounded corners, to a cruciform shape. The south side has clearly been subsiding, as Sarah has noted when sampling the floor. 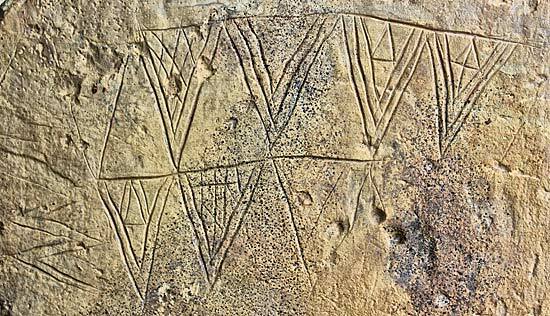 This means that the incised stone is not just a wonderful example of late Neolithic symbolism, but also reveals crucial clues to the fate of the building. Remarkably, our brave visitors continued to visit the site in significant numbers. Those who plan to come tomorrow should be assured that the weather will be much better. Please! A hardy crew in Trench T battle on through wind and rain. Hi everyone, my name is Elise Levy and I am one of the students from the Willamette group. 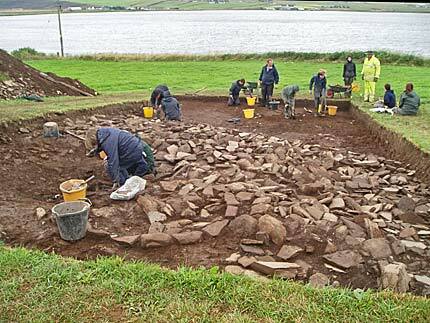 I am, once again, spending my day working in Trench T, where I have been working so far at Ness of Brodgar. It was rainy and windy at the beginning of the day, which I am beginning to figure out is quite a common weather occurrence in Orkney, so the Willamette and UHI students got to go on a short field trip to the Ring of Brodgar. It was great timing because last night Jane gave a lecture explaining some of the ring’s significance in Neolithic culture on Orkney. The Ring of Brodgar was fascinating; I particularly enjoyed looking at each stone and seeing all the engravings on it, some dating back to the vikings. We then all climbed up on to some of the surrounding mounds which gave a great view to the surrounding area. It was great to stand up and look around and realise that the area is so rich with history. After the field trip, we went back to work in Trench T.
See you tomorrow when hopefully the weather is better!